MIT chemical engineers have designed tiny particles that can "steer" themselves along preprogrammed trajectories and align themselves to flow through the center of a microchannel, making it possible to control the particles' flow through microfluidic devices without applying any external forces. The new MIT approach, described in Nature Communications, requires no external forces and takes advantage of hydrodynamic principles that can be exploited simply by altering the shapes of the particles. The work builds on previous research showing that when a particle is confined in a narrow channel, it has strong hydrodynamic interactions with both the confining walls and any neighboring particles. These interactions, which originate from how particles perturb the surrounding fluid, are powerful enough that they can be used to control the particles' trajectory as they flow through the channel. The MIT researchers realized that they could manipulate these interactions by altering the particles' symmetry. Each of their particles is shaped like a dumbbell, but with a different-size disc at each end. "Now that we understand how the asymmetry plays a role, we can tune it to what we want. If you want to focus particles in a given position, you can achieve that by a fundamental understanding of these hydrodynamic interactions," Eral says. "The paper convincingly shown that shape matters, and swarms can be redirected provided that shapes are well designed," says Patrick Tabeling, a professor at the École Supérieure de Physique et de Chimie Industrielles in Paris, who was not part of the research team. "The new and quite sophisticated mechanism … may open new routes for manipulating particles and cells in an elegant manner." In 2006, Doyle's lab developed a way to create huge batches of identical particles made of hydrogel, a spongy polymer. To create these particles, each thinner than a human hair, the researchers shine ultraviolet light through a mask onto a stream of flowing building blocks, or oligomers. Wherever the light strikes, solid polymeric particles are formed in the shape of the mask, in a process called photopolymerization. During this process, the researchers can also load a fluorescent probe such as an antibody at one end of the dumbbell. 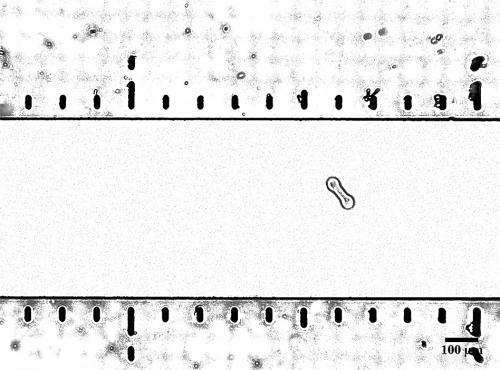 The other end is stamped with a barcode—a pattern of dots that reveals the particle's target molecule. "Self-steering particles could lead to simplified flow scanners for point-of-care devices, and also provide a new toolkit from which one can develop other novel bioassays," Doyle says. The research was funded by the National Science Foundation, Novartis, and the Institute for Collaborative Biotechnologies through the U.S. Army Research Office.